Wedding magazines, blogs and Pinterest are full of trends this time of year. But if you're trying to design a wedding that's so completely you that it couldn't be anyone else's, studying those lists is no way to do it. Every choice you make — from your venue to your menu, from your stationery to your send-off — is a chance to weave what matters most into the fabric of your day. It’s a long, long list, but here are a few key areas, plus some you may have overlooked. While your vows are front and center — and the first thing to come to mind when personalizing your wedding — there are other gems to mine here as well. Mendelssohn’s Wedding March and Pachelbel’s Canon in D are classics, but are they really you? Does your taste in readings lean more toward Ogden Nash’s “Tin Wedding Whistle” than passages from Scripture? There’s literally no law that says you can’t say anything you want during your wedding ceremony. Planner’s Pick: Hands down, our favorite recessional to date (of course, we haven’t heard yours yet!) was Jenn and Chase’s choice of The Proclaimers’ “I’m Gonna Be (500 Miles).” The lighthearted lyrics, cheeky romance, and infectious beat set the perfect tone for the party to come. Of course you’ll need to consider your color palette, the season, and your budget, but there can be so much more to choosing specific blooms. 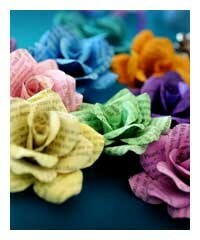 Like the Victorians who created a literal language with flowers, the varieties you choose can speak more than words. Hydrangeas that remind you of tea parties on your grandma’s wraparound porch. Lush tropical flowers that call up sweet memories of the cove in Kaui where you said yes. 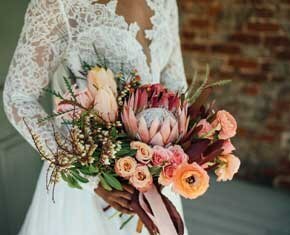 Planner’s Pick: We loved Elizabeth’s choice of King Protea — South Africa’s national flower — as the focal point of her jaw-dropping bouquet. She and Daniel first met on an international flight, they’re crazy about travel to exotic destinations, and they’ll spend their honeymoon on safari near Kruger National Park. What could be more perfect? 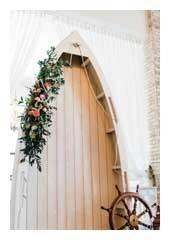 As many stunning forms as they can take, arbors used as ceremony backdrops are hardly the only way to command attention. Consider incorporating large-scale family heirlooms like the inherited oak pedestal table one bride used for her cake display; things you’re excited to have in your home after the wedding’s over, like the restored antique desk another couple used for their beverage station; or a handcrafted piece like the incredible rowboat used in lieu of an arbor. Planner’s Pick: Nicki and Tracy planned their reception for the sprawling backyard of the home that had once belonged to Tracy’s grandparents. As family arrived from all over the country to celebrate with them, we turned “Aunt Alice’s tree” into a living family tree, with framed photos of five generations suspended from its branches on ivory silk ribbons. Think about going beyond floral-only centerpieces to include other elements that complement your design concept, like coral, driftwood, and sea glass for a “coastal chic” wedding, or stacks of favorite books for a pair of English majors. Or choose names instead of numbers for your tables: places you’ve lived, vacations you’ve taken, movies you love, even NASA mission groupings for a couple of aerospace engineers. Planner’s Pick: We're still swooning over Amanda and Justin’s “vintage boardwalk” design, where their tables were a perfect blend of his passion for roller coasters and her love of the 1940s. Designated by antique postcards depicting famous coasters, each table combined petite arrangements of garden blooms with miniature Ferris wheels and carousels, family silver, Depression glassware, and World War II-era mix-and-match china. If the idea of a guest book leaves you yawning, take heart: This is a great opportunity to let your creativity off the leash. 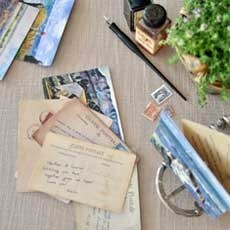 Some of our favorites haven’t been traditional books at all, like a batch of Impressionist postcards for a Provence-inspired wedding. Planner’s Pick: Although they grew up hundreds of miles apart, summers at the beach were always a part of both Claire and Will’s family traditions. So when we suggested a chronological photo album charting the summers of their lives and ending with their oceanfront engagement shoot, both moms jumped at the chance to collaborate. The result brought the couple to tears. The best favors aren’t just personalized but truly personal — as well as either delicious or useful. Think about coffee beans from your favorite Sunday morning hangout. Sweets based on cultural traditions. Donations made in your guests’ honor to a charity that speaks to both of you. Planner’s Pick: Life-long book lovers Caitie and Curt weren’t even dating yet when she came down with mono and he started reading to her over the phone every night from one of his favorite novels. Two years later, as their wedding plans started taking shape, Caitie found online instructions for making book-page roses and knew instantly which pages she’d use. Turning the roses into refrigerator magnets made them a practical as well as poignant keepsake. There are so many details you’ve obsessed over, so many elements to capture, and so many different styles and approaches to wedding coverage — from light and airy to dark and dramatic, fine-art portraiture to documentary-style photojournalism, exquisitely composed detail shots to dance-floor shenanigans on the fly. That’s why it’s so important to find someone whose style matches your own, and whose personality is such a good fit that you can relax into it, hand over the reins, and be confident they’ll capture your day exactly the way you want to remember it. Hopefully some of the ideas here resonate, but we’d hate to think you’re limiting yourself to only these categories. There are plenty of opportunities for personal touches that don’t fit neatly into any box at all (you wouldn’t believe what we had to cut to make room for these!) and we’d love to help you figure out how to incorporate what really calls to you.